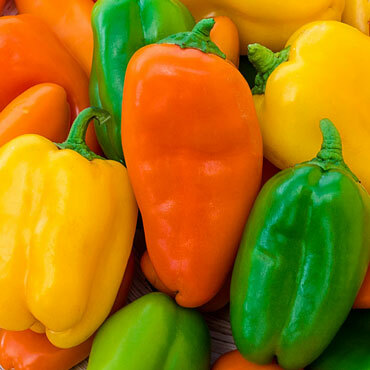 Once you've tried Sweet Pepper Yum Yum's mini bell peppers, you'll never go back to store-bought again! These delicious mini bell peppers grow quickly, and in three bright, gorgeous colors: tangerine, scarlet red, and sunshine yellow. Best of all, they're practically seedless! Enjoy them threaded on kebabs or stuffed with all kinds of fillings, like tzatziki sauce or a ground, spiced meat. A handfull of these peppers will fit perfecly in lunch boxes for both kids and grown-ups, delicious when eaten on their own or dipped in your favorite dressing. Plus, they'll maintain their crunch and light, sweet flavor when stored. 55 days to maturity. Spacing: Space 18 - 24 inches between plants, 24 - 36 inches between rows. Set plants out when they are 6 - 8 inches tall and when all chance of frost has passed. Color: Eye-catching mix of tangerine, red and yellow peppers. Depth: Plant seeds 1/2 inch deep. Start seeds indoors, 6 - 8 weeks before the last frost-free date. Days to Maturity: 55 days from transplanting into garden. Fruit: Nearly seedless. Very sweet delectable flavor. Eye-catching mix of tangerine, red and yellow peppers. Miniature bell-shaped peppers. Approximately 2 inches long. Size: Miniature bell shaped peppers. Approximately 2 inches long.